New season of Wisconsin Foodie hits the airwaves January 3rd on Wisconsin Public Television 7:30pm, and Milwaukee PBS 9:30pm (set your DVR). What happens when you challenge three Wisconsin chefs to create three different dishes with the same Variety of Cheese? Magic! In this delicious episode of Discover Wisconsin, we visited the Lakely Restaurant in Eau Claire and tasked Chef Nathan Berg with The Kammerude Gouda Challenge using Comstock Creamery’s signature cheese. Then we headed to Viroqua to issue Chef Luke Zahm at the Driftless Cafe the Blue Cheese challenge, having him use Sid Cook’s ‘favorite cheese’, Glacier Penta Creme Blue Cheese. Look here for the blog and social media accounts: Instagram & Facebook. There are restaurants that are farm-to-table, and then there are restaurants that don't know what's on the dinner menu until all the deliveries from nearby farms are in at around 4pm. Driftless is the latter. It makes it easier that Wisconsin has the highest concentration of organic farms in the nation; the ubiquitous Organic Valley brand has its HQ 15 miles away, and 200 farms are in the area. WHAT: A reverent homage to the land through inventive farm-to-table menus and masterful flavors. WHY: The Driftless Café, owned by Ruthie Zahm and her chef husband Luke, is a small town cafe in Viroqua, Wisconsin, that feels as if buoyant hipsters snuck in and staged an ongoing pop-up dining concept. Situated in the Driftless region (where there is a higher concentration of organic farms than anywhere in the state), the cafe is a magnet for locals and visitors alike who appreciate rustic cuisine and sustainable ingredients grown nearby. Chef Zahm’s menu is all heart, strained through a nouvelle cuisine-farmboy aesthetic. — K.C. Luke Zahm left Vernon County, a farming region in southwestern Wisconsin, as soon as he could. Growing up in the 1980s and 1990s, the area was depressed—dairy farming, which sustained much of the local economy, was in decline, and manufacturing jobs were leaving. A 40-minute drive from La Crosse to Viroqua yields priceless benefits. First, there’s the dramatically carved landscape, a breathtaking roller coaster of hills, valleys and vistas that locals probably learn to take for granted, but here’s hoping they don’t. This year's James Beard semifinals were filled with pleasant surprises. Wisconsin made a great showing, with four nominations from Milwaukee and an additional four from across the state. Even more impressive is that one of the semi-finalists was Luke Zahm, chef and owner of Driftless Cafe in Viroqua, a town of just over 4,000 people. Since the average population of Midwestern cities with James Beard nominated chefs is 220,000, it's common to see honorees from cities like Madison, Milwaukee and Minneapolis. But it's far more unusual for a small-town chef to hit the radar of the JBF team. Fortunately for Zahm, there were eyes on his work. Forage, Fish, Eat. Join outdoor guide Keith Warnke to explore the edible outdoors of Muscoda. Start by harvesting roadside asparagus, then head to the hills to hunt for morels, and finally jump into the streams and try fly fishing for trout. Driftless Café chef Luke Zahm brings the bounty together. Fork. Spoon. Life. Luke Zahm. Luke Zahm’s first jobs were in restaurants. While growing up in a small town in western Wisconsin, he worked as a car hop and spent time as a “certified sandwich artist” before moving away to pursue music. After working in Chicago, he made his way to kitchens in Madison. Working at Lombardino’s and making trips to the Dane County Farmers Market both helped him appreciate his Wisconsin roots. Turns out he had to leave to find his way home. Since 2013, Zahm and his wife, Ruthie, who grew up in Viroqua, have operated Driftless Café at 118 Court St. in Viroqua. His menu is ever changing, but his commitment to the community stays constant. His mission is to shine the national spotlight on the area’s role in organics, farming and cooperatives — and it seems to be working. Luke and Ruthie Zahm, own Driftless Cafe in Viroqua. Photo by Drew Shonka. Chef Luke Zahm (Driftless Café). Photo by Drew Shonka. Chef Luke Zahm has been called a sort of “Prodigal Chef.” He grew up in the Driftless Region of Southwest Wisconsin, moved around gaining important and transformative cooking experience, and finally decided to move back to the area, settling his family in the small town of Viroqua, Wisconsin (pop. 4,362). For most restaurants the magic happens in the kitchen, but for Driftless Café the alchemy really originates beyond the back door. At this small Viroqua restaurant, the back of the house is truly the back of the house, where one can find the new pit smoker, a basement chock-full of summer preserves, and a delivery location for local farmers, foragers and vendors from the region. So much of the magic of this place begins before the ingredients even hit the kitchen. From left to right, chefs Luke Zahm (Driftless Café), Kevin Micheli (Charmant) and Anthony Swartwout (The Mint). Photo by Jim Klousia. Roelli Cheese | Driftless cafe. We are at Roelli Cheese House in Shullsburg, WI, home of the award winning Dunbarton Blue. Chris Roelli takes us through his process of making a batch of the Dunbarton Blue. He also shows us his cheese caves where we get to have a taste test of an experimental cheese! Then we head to Driftless Café in Viroqua, WI where Luke Zahn uses Roelli cheese to make two incredible dishes! My name is Luke Zahm and I'm the Chef and Owner of the Driftless Café. With the help of my wife Ruthie and 30 employees, we own and operate our 44 seat restaurant. As Wisconsin natives, the Driftless Region is where we call home. After working in kitchens for over a decade, I decided that if I wanted to cook with the best ingredients possible I would need to move back to the Driftless – back to the epicenter of the organic food and farming movement. We purchased the Café in 2013 with the idea that we could create a restaurant that was about more than just food – we wanted to showcase the amazing farmers and food artisans that call this place home. We wanted to support our friends and neighbors to create a stronger financial community. We wanted our food to serve as a bridge in our community and as a vehicle for growth into the future. "I grew up in La Farge and had a paper route in the 80's. I remember delivering the Sunday paper, and on the front headline there'd be weekly stories about dairy farmers committing suicide. The dairy farming industry had bottomed out, and these farmers were losing their century farms.. Originally, every single little outskirt community had their own creamery. Driftless Cafe in Viroqua draws customers from miles away. VIROQUA — The Driftless Cafe, a farm-to-table restaurant that Luke and Ruthie Zahm bought in 2013 and expanded last year, is drawing customers from miles away. 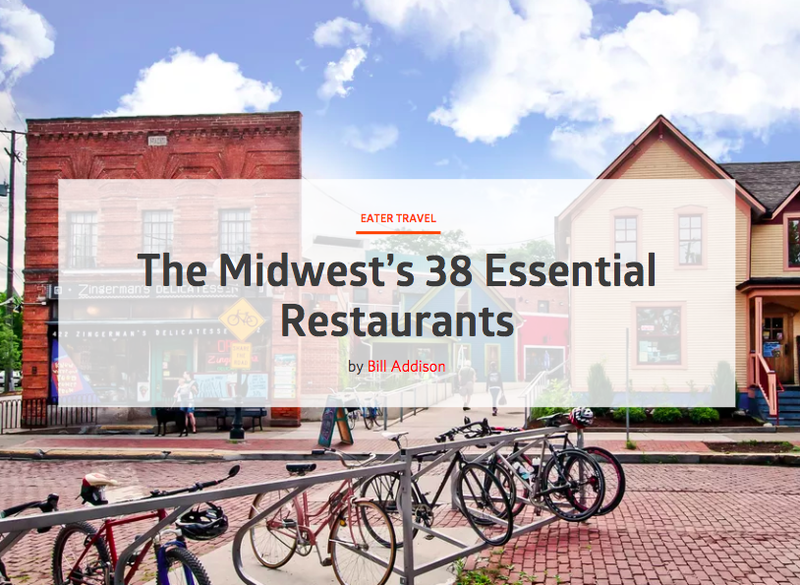 “Some of them come from a long ways away,” including people who live in Madison, Milwaukee, Chicago and Minneapolis, said Luke, who manages the restaurant.